I moved to Los Angeles in the summer of 1979. At that time, the Dodgers had an impenetrable infield, with Cey, Russell, Garvey, and Lopes. In the first week of the 1983 season, coming off that ROY, Sax made an errant throw to home plate in the ninth inning of a game against the Expos, and a switch flipped. By the All-Star Break, Sax had committed twenty-four errors, on his way to a total of 30 for the season. Fortunately, Sax was able to get his “yips” under control, and go on to play eleven more seasons, eight of them as a second baseman. After 1983, fans and the media began referring to what happened in Los Angeles as “Steve Sax Syndrome.” But to baseball aficionados, it really was “Steve Blass Syndrome.” In 1971, Blass won 15 games with a 2.85 ERA, helping the Pirates win the World Series. In 1972 he was an All-Star, winning 19 games with a 2.49 ERA. But in 1973, he lost the ability to pitch. He walked 84 batters in 88 innings (triple his previous walk rate), hit twelve batters, threw nine wild pitches, and saw his ERA balloon to 9.85. Blass retired after pitching one game in 1974. Mackey Sasser was a promising catcher for the Mets in the late ‘80s. His troubles began in 1990, exacerbated by a leg injury that forced him to remain crouched when he threw the ball back to the pitcher. It got to the point that Sasser simply could not throw the ball 60 feet to his battery mate, committing fourteen errors in just 87 games. Sasser caught half as many games in 1991, basically half as many as that in 1992, and then only sixteen more before he retired three years later. This list could go on and on. We could include the aforementioned Chuck Knoblauch and Rick Ankiel and Jarrod Saltalamacchia, but there is no need to dig that deep. You get the point. The reason for rehashing the syndromes of these players is in an attempt to make sense of what happened and is happening to Orioles 1B/DH Chris Davis. As recently as 2013, Davis led the league in homeruns (53) and RBI (138), won the Silver Slugger, and came in third in MVP voting. In 2015, Davis hit another 47 dingers to lead the league, and then the Orioles signed him to a 7/$161M contract. In 2016, Davis had a career high in strikeouts with 219 (only a 5% increase from his previous high the year before), but he also hit 38 homeruns. All seemed right with the world. In 2017, Davis missed 34 games, but still managed to strike out 195 times, while hitting a swarthy .215 and slugging .423. A keen eye may have seen trouble on the horizon. 2018 is when the Crush Davis became Crushed Davis. He played in 128 games, struck out 192 times, hit .168, and slugged .296. And when the season ended, the Orioles still owed him $92M. The baseball world was agog with Davis’ performance; but, it should be noted, he has been forthright about his issues. There was some hope that time away from the game and some tweaks with his mechanics would lead to better outcomes for the remaining three years of his deal. File that in the best laid plans category. As of this writing, Davis has yet to record a hit this season. He has struck out 13 of the 27 times he has come to the plate. If you go back to last season, he is 0 for his last 44 with 24 Ks. He is 1 for his last 55 with 27 Ks. In his last 559 PAs, he has 79 hits, 16 HRs, 46 walks, and 209 strikeouts! We could take these stats back to last his last 1,000 or 1,500 at bats, but they wouldn’t look any better. I don’t relish listing any of the above. I have provided this information to denote that the yips are not the exclusive province of defensive players. It is quite clear that a couple of seasons ago, a switch flipped, and Davis can no longer throw the ball to first base, or back to the pitcher, or to home plate. He can no longer hit a Major League baseball. Sure, the broken clock theory is in play and he makes the occasional contact. And if the bat is in the right place at the right time, he is still strong enough to hit the ball really far. But, as a practical matter, Davis is more Steve Blass than Steve Sax. I am not sure if there is a “right” thing to do. Far be it for me to tell a guy to hang ’em up and walk away from nearly $90M. Far be it for me to tell the Orioles to cut a franchise player or send him down to the minors. 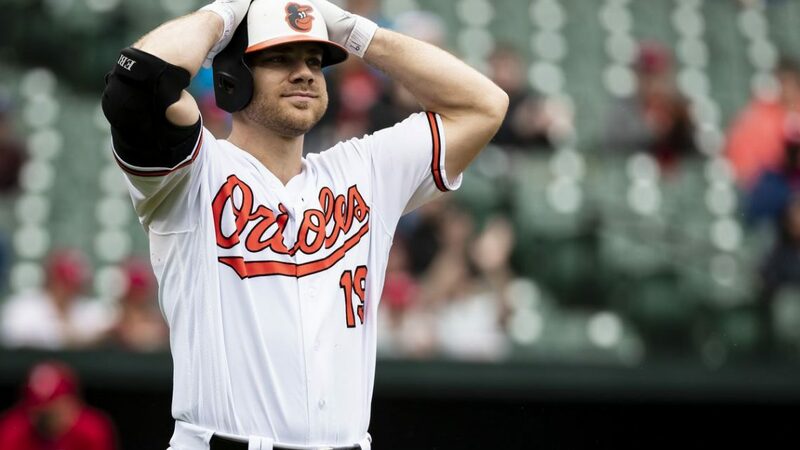 What I do know is that it is not fair to the team, the fans, but most especially, Chris Davis, to keep sending him up to the plate just to fail and flail – spectacularly – again and again. I did have one thought: Mr. Davis could head about nine hundred miles southwest to Dothan, Alabama. Drive over to the campus of Wallace Community College and look for the baseball field. Seek out the head coach. I am sure Mackey Sasser – who came to grips with his yips with the help of Dr. David Grand – could have some helpful advice. When he was at his best, Crush Davis was a joy to watch. No one hit the ball farther with less effort. He hit 223 homeruns over a six-year span. As a baseball fan, I sure hope he gets back there again.